Special Containment Procedures: SCP-271 is to be stored as long as possible in Containment Unit !12 in ███ █ █████ ████████████████████ ██ ████ on a meter-high stone pedestal (SCP-271-01), which will be flooded with water and sealed off in a hollow 5-cm-thick sphere, composed of glass saturated with iron. Permanent neodymium-████████ magnets will be mounted around the (standard-sized) room to suspend the sphere in-air and repel unwanted intruders. The room will be lined with pyrolytic carbon to contain the magnetic field generated by the magnets. The door to the room is to be left unguarded and disguised as an ordinary janitorial closet, and kept locked by an unobtrusive password box mounted in the wall down the hallway and around the corner that appears to be a thermostat. Dr. Vg is to change the password on a monthly basis. All study is to be observation-only until further notice. In case of unauthorized access electromagnets in the room are to be activated by remote to destroy the glass sphere so that recovery may be simplified. 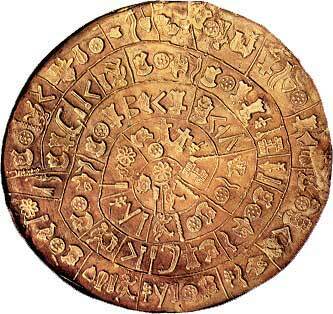 Description: SCP-271 is a small disk, composition unknown but metallic in nature, a little more than 4 cm in diameter, and engraved with a number of symbols that may or may not represent an unknown alphabet. These symbols are infectious to their environment over time, gradually appearing as if invisibly carved into nearby objects. They are capable of escaping through any hole, however minute, but have been demonstrated to be unable to penetrate non-gaseous fluids. Objects that carry the symbols for a sufficient time begin to be changed on a molecular level to the same material as the SCP; both the engraving and petrification processes are extremely painful to biotic organisms. The only known method for purging the symbols is the destruction of the object, and it is not possible to do this to SCP-271 itself. At this time both SCP-271 and SCP-271-01 are thoroughly coated with the engraved symbols and seem to "swim" slightly - Dr. Vg and other observers have described them as looking "like the far side of a heat wave" or "not quite all there". The symbols also appear to have fractalized somewhat; studies with vision-enhancing equipment have revealed miniature symbols inside and around the larger carvings on both objects. SCP-271 was a previously unknown SCP recently acquired from a shrine belonging to the Church of the Broken God by Mobile Armed Task Force 12 when [DATA EXPUNGED]. It was previously stored in a room of its own, which documents note was to be kept sealed "until the assembly was ready". Documents acquired at the same time suggest that [DATA EXPUNGED]. The platform is original; on account of the extensive writing on the room in which it was contained, the shrine itself was pulverized. However, due to rapid retaliation by enemy forces, the remnants of MATF-12 were forced to [DATA EXPUNGED]. Contact has been reestablished, but the nature of the SCP and the enemy seekers prevent easy recovery, and it is currently considered more advisable for the SCP to remain hidden if comparatively unprotected than to attract attention by launching a very expensive recovery mission. MATF-12 has been ordered to conform itself into CU-!12 (the exclamation mark denoting their atypical existence outside of a secured SCP Foundation area). Addendum: SCP-271 is not to be brought into the presence of SCP-882. EMERGENCY BULLETIN: Reports from other embedded sources indicate that as of ██-██-████ the Church is aware of CU-!12 and the location of SCP-271, and is planning an imminent assault against the unit. SCP-271 is to be kept out of enemy hands at all costs. CU-!12 has been ordered to mobilize and prepare for evacuation. A recovery team is being prepared for immediate deployment under the direction of Agent DuPont. A more detailed report is to follow.